The paint on a floor or truck scale isn’t simply to make it look nice. Although that’s partially true, it’s only a small reason as to why paint is applied to the steel structure of a truck scale. As you may know, the primary purpose of a layer of paint is to prevent the rusting and corrosion of the steel. Ferrous metals like iron or steel have the weakness of oxidation and can form rust, which weakens the metal and causes it to fall apart. This much is obvious. To prevent the oxidation of these metals, manufacturers typically apply coatings of paint during the manufacturing process. But simply applying a layer of paint isn’t enough to prevent your scale from rusting. In fact, you probably already have a truck or floor scale that’s rusting despite being coated in a layer of paint. Well as soon as that paint is scraped off either by something hitting or rubbing against the scale, the steel is now exposed to moisture in the air, causing oxidation, which is precisely why the correct thickness of paint is necessary for the longevity of a scale’s life. Too little paint and a light graze will expose the steel, to thick and it will run or glob. Paint that doesn’t dry evenly is prone to peeling. Just think about a car you’ve had in the past. Perhaps you… or someone in your family… ran into the side of the garage, transferring the paint that was once on the car onto your garage. If the damage to the exterior of the car didn’t affect the performance, you may have left it. But you soon realized that aluminum that was once coated in paint had began to oxidize. This is the same thing with steel decks on truck and floor scales. A correctly applied coat of paint, the harder it is to scratch down to the metal. Of course that doesn’t mean the paint won’t ever come off. I would just personally like to know that a small hail storm isn’t going to strip the paint away from my truck scale. 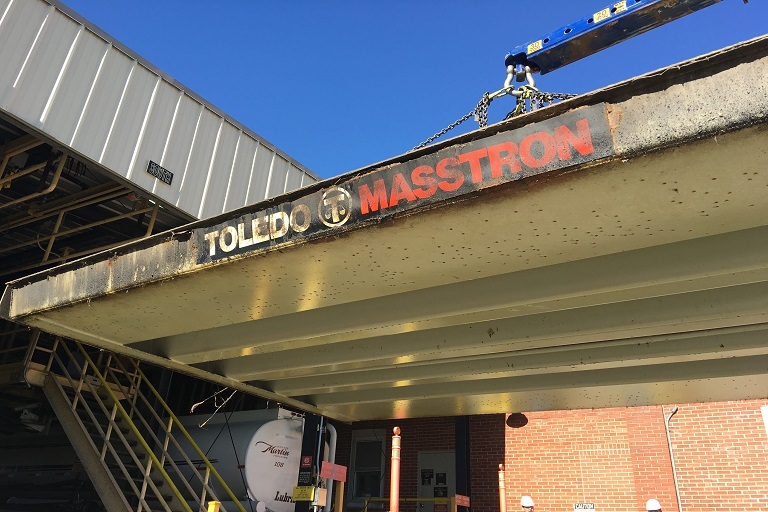 METTLER TOLEDO understands the importance of structural integrity as the leading scale manufacturer in the world, and they see the quality and thickness of the paint is just as important as the robotic, continuous welding done throughout the orthotropic rib design of their truck scales. The painting process of every METTLER TOLEDO truck scale goes through three steps at three different places in the facility. Like sandblasting, but with steel pellets. If you’ve ever applied a sticker to a surface, you’re probably well aware that the surface needs to be cleaned from dirt and grime or else the sticker won’t stick. Well that’s true with paint as well. 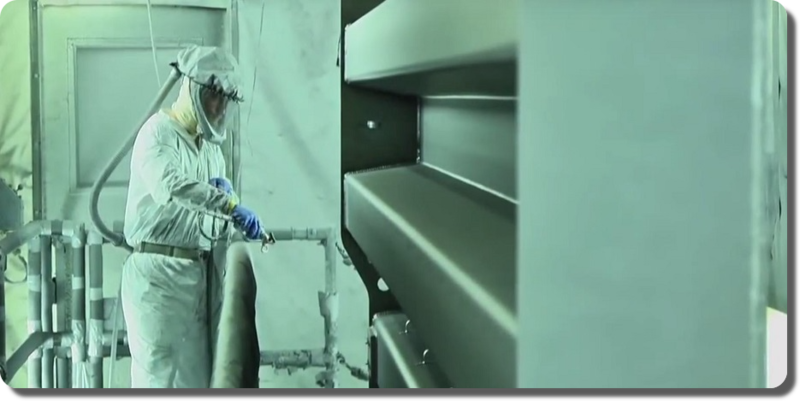 The first step in METTLER TOLEDO’s painting process is steel shot blasting the modules to a required 1.5 to 2.5 mils blast profile for the cleanest, paintable surface possible. The module is rolled through a conveyor in an enclosed area at a consistent, slow speed while being steel shot blasted evenly across the module at a steady pace for perfect distribution. METTLER TOLEDO truck scale module being run through the steel shot blast machine. Once the truck scale module passes completely through, a quality inspector checks the quality of the shot blast using an blast profile gauge after using compressed air to remove dirt, debris, and excess shot dust from the surface. The inspector is required to check each module in 8 different spots to make sure each spot on the scale conforms to the 1.5 to 2.5 mil specs. But not just 8 spots, they’re required to check 3 spots, all within a 6 square inch of each of the 8 spots. That’s 24 checks! All to make sure the shot blast meets quality standards. When all the checks have been notated and have passed their quality inspection, the quality inspector places the form with the mil specs, module details, and their signature with the module to be moved on the the next station. After the module has been steel shot blasted and inspected, it is then moved into a paint room vertically via rail system. The module is painted with a high performance, anti-corrosive coating. This room is where METTLER TOLEDO’s professional painters hand paint each weigh module. They operate on a semi-automatic, moving gantry where the painter remains at eye level during the entire process of coating the module. The ability to paint the modules manually is important to be able to allow complete coverage and uniform thickness that could otherwise be missed by an automated process, especially in crevices and corners. 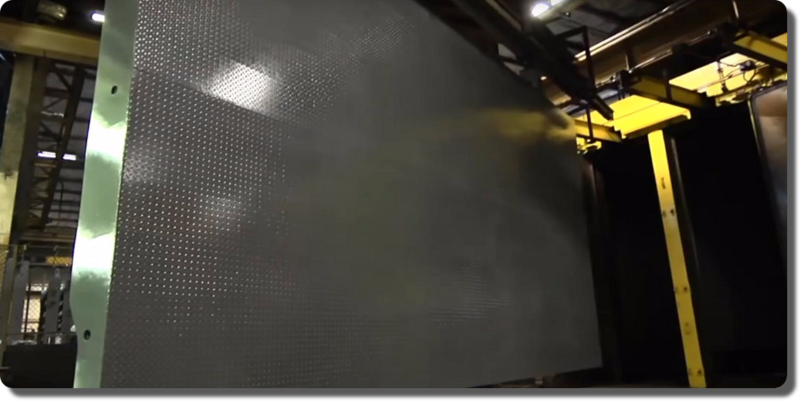 The module is painted by hand at consistent eye-level using a mobile gantry. Much like the steel shot blast process, the painters are also required to inspect the paint using a wet mil gauge to make sure the quality of the paint job remains consistent throughout the process. While checking the paint specs during the painting process, the wet paint is to remain 10.0 to 12.0 mils thick. Finally, after the painter has thoroughly applied a uniform coat of paint to the specified thickness, the module is then moved out of the paint booth and into an industrial oven and cured via the same guided rail system to bake on a rugged finish. This is the final step in protecting the thickness of the paint from being damaged, which ultimately exposes your truck scale to the threat of oxidation. Cured module exits the oven via guided rail system. Although the painting process is considered to be over, the quality inspection of the module has only just begun. The final step after the paint has cured is for the final quality inspector to check the dry film thickness (DFT). The quality inspector checks the DFT in the same fashion as the steel shot blast inspection. In 8 different, pre-determined locations, 3 times within a 6 square inch area on each of the 8 points. Each DFT check is notated similar to the steel shot blast test and also placed with the module along with all other inspection documents in a magnetic envelope and stuck to the module. In the unlikely event ANY defect is found, the weigh module is immediately rejected and the quality assurance managers are contacted. If any of the locations of the paint specifications are out of painting tolerance, the module is set to be repainted and cured to maintain consistent standards. A truck scale module that passes these paint requirements and all other inspection and quality requirements is ready for shipping. When the shipper receives the module, they will copy all forms and documents regarding the inspection and quality standards attached to each of the module and turn them in to their supervisor. The original forms are then placed into the scale delivery packet and the packet is filed with the copy of the delivery note for optimal trace-ability. The documentation and stringent inspection processes aren’t just for show; they’re put into place to ensure the production of the highest quality products on the market. That’s why METTLER TOLEDO can place their truck scales under a full 10 year warranty. And we’re not talking about those conditional, limited warranties that only cover certain parts of the scale and also doesn’t cover the travel and labor repair costs. METTLER TOLEDO’s truck scale warranty covers the scale’s load cell system, cables, and deck/weighbridge for 10 years* even from lightening strikes! Additionally, METTLER TOLEDO will also cover any digital indicator connected to the scale for 5 years, and 6-10 years if the indicator is damaged by lightening (power surge).